Improve your company culture by tracking employee journeys and turning insights into action through employee feedback and ratings. Engage your middle-management by assigning relevant content from your intranet, the internet, YouTube, Vimeo and trainings. Facilitate feedback and discussions by integrating your Yammer into our Dolphin. Gain real-time insights into employee performance and behavior. You get what you measure! We help you make better use different performance analytics in your corporate communications and training. This group is the busiest and under the heaviest burden in your company. They are also the single most important group to drive your change. Target management with relevant content from any digital source. Follow up and make sure that they are engaged. Provide support to those from whom you expect the most. Don't just communicate and train people on essential topics. Inspire them with inspirational videos, too! Give them building blocks for their own personal growth & development, which is vital for all of us – from trainees to top executives. We work to get, but we really get when we give. 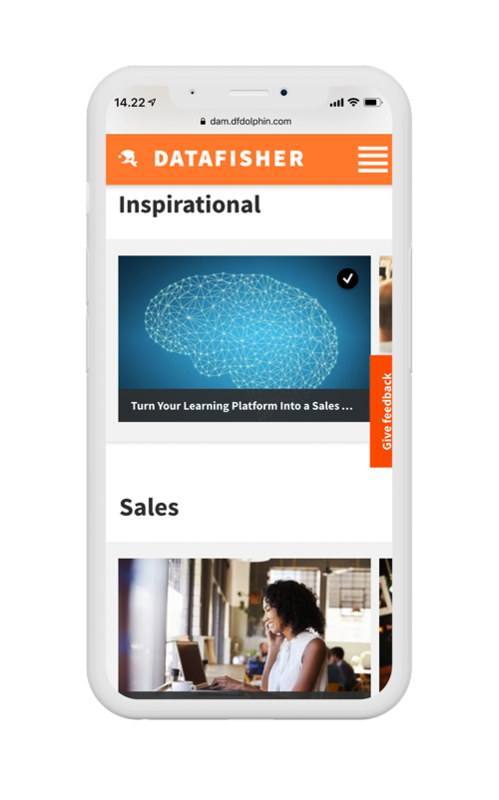 Activate Datafisher’s Inspirational Channel, which is open to all of your organization at no additional cost. Change your culture by inspiring people! Activate Datafisher's Inspirational Channel on your Dolphin Platform.